A1's York Corner Summerhouse is a quality five sided summerhouse which, as the illustration shows, is perfectly designed to fit neatly into the corner of your garden. It's available in three sizes which more or less guarantees you'll find one to fit your requirements and its attractive apex roof and Georgian styled doors and windows along with the antiqued fittings provide a pleasing exterior appearance. The double opening doors to the front allow plenty of easy access while the outward opening side windows are ideal for light and ventilation. The York is finished in 125 x 16mm tongue and groove cladding mounted on 32 x 54mm framework. The door and window furniture comprise japanned metalwork while the windows are glazed in 4mm glass. The roof and floor are constructed in 125 x 16mm board. Note that while the illustrated model is shown with a shingle style roof, a shed felt finish is supplied as standard. The Summerhouse is available in three sizes; 7' x 7' (2.13x2.13m), 8' x 8' (2.44x2.44m) and 10' x 10' (3.05x3.05m). Roof height in all sizes is an accommodating 6'5'' (1.96m) at the eaves rising to a peak of 10'4'' (2.7m). The A1 York is supplied pre treated with a factory dip finish. While this will be sufficient to protect the timbers prior to delivery it will be necessary to apply a final decorative/preservative finish at the time of erection or very soon thereafter. This finish should be maintained on a regular basis to ensure a long life for the building. The Summerhouse is available with the option of either Georgian or leaded glass window glazing. The model illustrated above is the Georgian version. An installation option may also be available at additional cost. Unless an installation option has been purchased the York will be delivered with all necessary fittings ready for assembly by the purchaser. The A1 York is undeniably a stylish and attractive corner summerhouse and the 16mm cladding is a step up from the 12mm timbers you tend to find in cheaper models. The choice of sizes means that you should be able to find something to fit your particular needs as well. Note though that you will have to pay extra if you want the attractive shingle finish to the roof shown on the illustrated version - we don't think it's strictly necessary other than for aesthetic reasons as a roof finished in shed felt should provide adequate wind and weatherproofing. The York doesn't come cheap though and we're not convinced that in value for money terms it compares favourably with some other models we feature at prices broadly the same ball park. The Greenacre 3x3, Rowlinson Kestrel, Wenlock, Ardcastle and Gudrum Melanie for example will all give you a 28mm log construction at prices comparable to that of the 16mm A1 York. 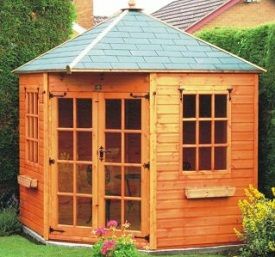 If you own an A1 York Corner Summerhouse we'd be delighted if you'd submit a review to help other prospective customers. You can do this on our Corner Summerhouse Review Form - we look forward to hearing from you.